On October 8, 2000 Manick Sorcar and his troupe performed at the prestigious Auditorium Theater, Denver Center for the Performing Arts, as a part of the Colorado Performing Arts Festival, sponsored by the City and County of Denver. Established in 1908, The Auditorium Theatre is a 2,065-seat proscenium house in a neo-classical style, home to the Colorado Ballet and The Denver Center for the Performing Arts' Broadway touring shows, presented by Denver Center Attractions. The show entitled "Flames of Fusion", which carried fusion dances of the East and West were basically an expression of the 'Generation X', directed by Manick, and choreographed by his daughter Payal Sorcar. Carrying a flavor of the preceding highly successful show "The World of Manick Sorcar" it enchanted the audience with music, dance, drama and magic integrated with spectacular stage settings and state-of-the-art lighting. 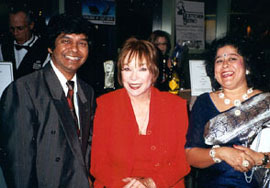 About two weeks later, Ms. Shirley MacLaine, the legendary Hollywood film star was awarded the Mayor's Life Time Achievement Award at the Buell Theater, which is located next to the Auditorium Theater - all inside the massive 4-city-block campus of the Denver Performing Arts Complex. Invited by The Denver Film Society, Manick Sorcar and his wife Shikha were 'special guests' at the occasion. 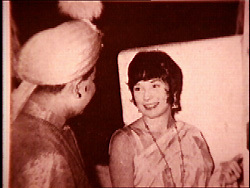 It was a very heartwarming reunion for both Ms. MacLaine and Manick Sorcar as the event flashed back memories of 1964, when she had made a special trip to Calcutta, India, to meet Manick's father legendary magician P.C. Sorcar, Sr. at the backstage of Calcutta New Empire Theater.